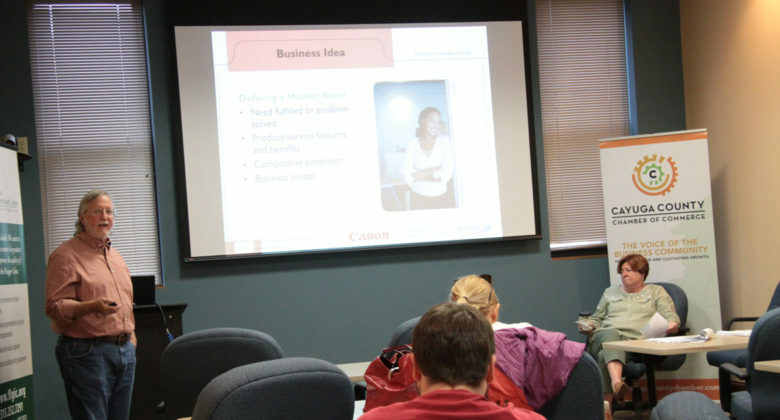 The Auburn SCORE, a group of volunteer mentors with a mission to assist entrepreneurs with their business plans, has begun its third year of the “Simple Steps for Starting Your Business” workshop series. This series provides easy access to information on a range of topics including marketing, costs, and financing, so it’s an excellent way to test your business idea while getting feedback from knowledgeable professionals. The series is scheduled to run through October meeting Monday nights at 2 State Street, Auburn. The first two sessions have already happened, but the workshop is still open to anyone wanting to come aboard. Session three, which runs Monday, October 1, is the Marketing Plan workshop and will host a presentation by Marty Doto, Communications & Marketing Chair of the SCORE Syracuse chapter. Marty will give an introduction to marketing communication methods and tools to maximize customer reach and discuss marketing strategies. By the end of the workshop, attendees will know how to outline their marketing strategy, test their marketing message, choose the right sales channel, and exercise their marketing strategy. Two more workshops follow: Financial Projections (10/15) and Funding Sources (10/22). For more information on SCORE’s Simple Steps series and to register for the workshops, click here to visit the registration page or contact Derek Simmonds, SCORE Mentor and Business Development Specialist at CEDA.